Today I will look closer at another Bourjois brand foundation for you. Let's see if it turns out to be hot or maybe not. Introducing Bourjois’ NEW mattifying high coverage foundation with 24 hour hold. 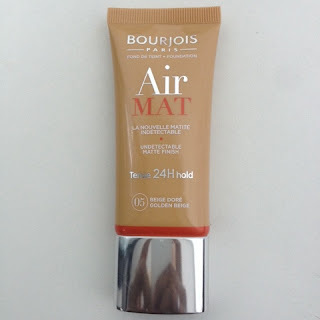 Bourjois' NEW Air Mat foundation has been specially developed to give skin a smooth, matte finish without shine. Its non drying, light-weight formula lets skin breathe whilst erasing imperfections. No, no, no ! This is the worst foundation I've ever used. On my face it looks so terribly, I would even say disgusting, bleee. This has almost only disadvantages which is very scary.